The Rapid transit category contains lines and stations in metro and light metro systems, rapid trams, rapid transit buses, urban cable cars and monorails, funiculars and other systems that transport passengers and do not run along city streets. Special drawing rules apply to light-rail transport systems. A rapid transit lines schematically represents the entire route covered by that mode of transport. You should only mark branches if the route number/name does not change. Don't draw map items that represent detailed track arrangements or rings used for u-turns. Don't draw any additional rapid transit line sections that are not publicly available (such as service tracks that connect different branches, depots and access tracks to them). 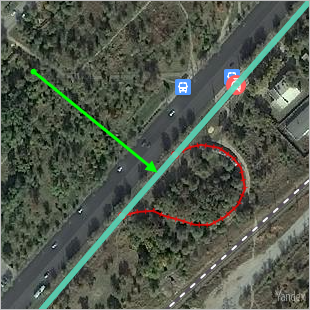 Use railway, tram track, and motorway items to draw detailed track arrangements, (depending on the type of transport). 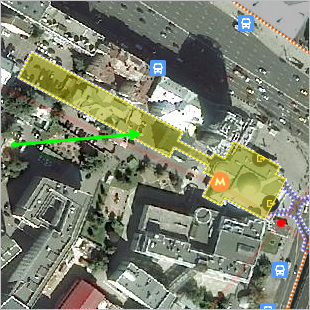 Don't draw metro lines on Yandex Map Editor that are under construction. Use placemarks to represent rapid transit stations. Don't draw underground or ground-level station maps. Rapid transit station placemarks represent the stations themselves, as well as the stops that the transport vehicle makes there. 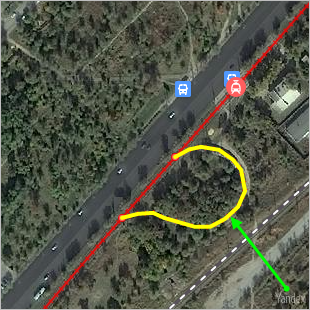 Put a placemark on the rapid line opposite the terminal or main exit. If these elements don't exist or it's hard to determine where they are, then put the placemark at the approximate geometric center of the station. Don't draw metro stations or exits that are under construction, in the planning stages, or abandoned. You can leave metro stations and exits on the map that are temporarily closed for reconstruction; don't delete them. Put placemarks at the exits to rapid transport stations. Don't draw station exit maps. You should not draw exits from cable-car and funicular stations that operate at ground level. If a station is wholly or partly located underground or has a fenced off perimeter that can only be accessed by passing through a turnstile, then put placemarks of the “Exit of rapid transit station” type at the sites of all actual exits to the city: at station pavilions, exits from underground passageways, entrances/exits from fenced off perimeters, etc. 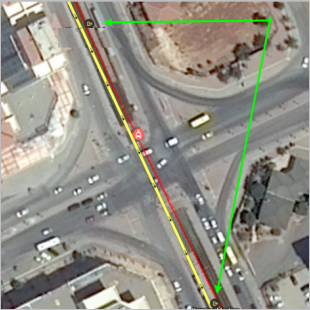 If a station is located at ground level and the perimeter is not fenced-off, then put the "exit" at approximately the same location as the station itself. If the entrance and exit to a station lobby or pavilion are separate from each other (for example, they may be on opposite sides of the pavilion), then you can create separate placemarks for the entrance and exit. The rapid transit items include light-rail transport systems (rapid trams and transport systems of the “light metro” type that are structurally similar to rapid trams). These will be referred to as LRT systems further in the text. Whether or not a specific transport system should be categorized as a rapid tram or light metro is decided on an individual basis. Draw LRT systems as rapid transit items (lines, stations, and exits from stations). Furthermore, rapid transit lines are duplicated by items of another category — tram lines. An ordinary tram layout is also drawn with ordinary tram tracks. Rules: tram junctions and reversal rings (see Section 3.14.1.1. Rules of drawing tram line sections). As rapid transit lines: draw the lines smoothly, with no sharp turns or bends. Draw stations and stops within LRT systems as rapid transit stations. 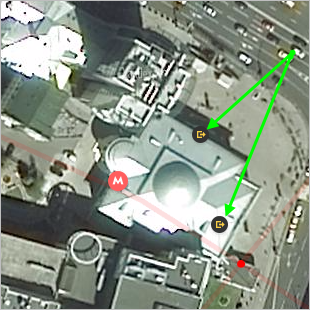 Put the placemark directly on the rapid transit line in the approximate geographical center of the station. See also Section 3.13.1.2. Rules for drawing rapid transit stations. 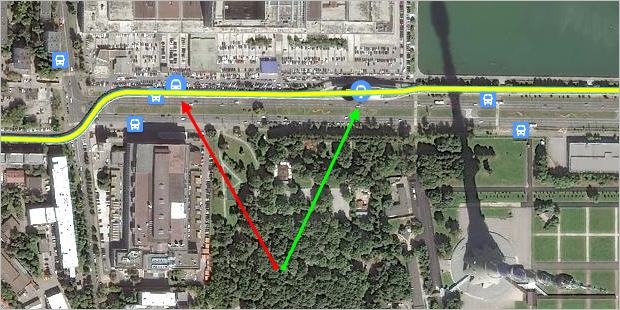 If an LRT station is located at ground level, then put the "exit" at the approximate geometric center of the station itself. If a LTR station is located underground (wholly or partly), then put placemarks of the “Exit of rapid transit station” type at the sites of all actual exits to the city: at station pavilions, exits from underground passageways, etc.